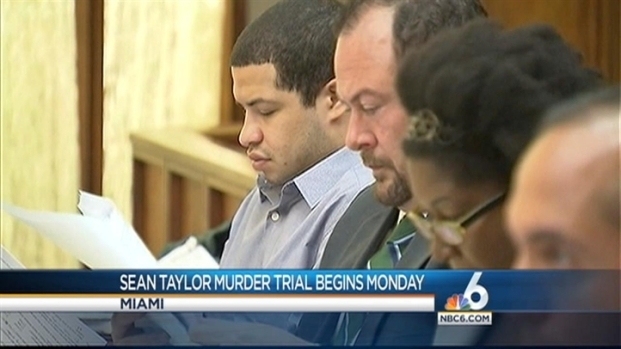 An alleged confession made by a man charged in the 2007 Miami murder of NFL star Sean Taylor emerged as a focus of his trial as opening statements were made in the case Monday. Eric Rivera, 23, is charged with first-degree murder and burglary with assault or battery in the death of Taylor, 24, who died following what prosecutors say was a botched robbery at his Miami-area home. Rivera was questioned at length and made a full confession on video, according to prosecutors. He voluntarily spoke with detectives without an attorney present, and even drew diagrams of the rooms and where everyone was at the time, Assistant State Attorney Ray Araujo said. "He describes in detail the plan, how they carried it out, who was involved, everything," Araujo said. "This defendant confessed to the murder of Sean Taylor, that he committed it." But the defense team said police wore down Rivera and coerced him into the confession. Defense attorney Janese Carruthers told jurors how cops got her client to allegedly confess. According to prosecutors, Rivera and four other suspects thought Taylor was not home early on Nov. 26, 2007 and that they would find lots of cash – but he was there and confronted them with a machete early. That's when Rivera shot him, prosecutors said. "Sean Taylor was murdered, shot and killed by this defendant Eric Rivera. Murdered outside his bedroom door," Araujo said. The former University of Miami football star had massive bleeding, he said. "He fell to the ground and as he bled the defendant and his friend drove away into the night," Araujo said. Taylor's girlfriend Jackie Garcia testified that before the shooting, he woke her up, told her he'd heard a noise and told her to call the police. She said she was scared. When Taylor went to the bedroom door, she said, "I heard a really loud noise, very similar to a gunshot and a scream, like 'ahhh.' "
Garcia said she thought that she heard Taylor screaming. She hid under the covers with her daughter next to her. No cash was found, and Miami-Dade Police got a tip that led them to Rivera and the other suspects, according to prosecutors. Garcia confirmed Monday that Taylor did keep large amounts of cash in the home. That was because, she told the defense attorney, "He liked to pay things with cash and he was an occasional gambler." Taylor, a two-time Pro Bowl safety for the Washington Redskins, had starred at UM, helping the Hurricanes to the national championship in 2001. Lawyers questioned dozens of potential jurors last week before selecting 12 jurors and four alternates on Friday. Rivera's trial has been delayed several times. Rivera and three others, all from the Fort Myers area, have pleaded not guilty and are being tried separately. Each faces a possible life sentence if convicted. A fifth man previously pleaded guilty to murder and burglary charges and is likely to testify against the others. Prosecutors say the suspects drove across the state intending to burglarize Taylor's Palmetto Bay home, confident he wouldn't be there. But Taylor, an All-Pro safety, was in bed, nursing an injury instead of taking the field with his teammates for a road game at Tampa. When the 6-foot-2, 230-pound player – well known as a ferocious hitter – confronted them with a machete, Rivera allegedly fired two shots. One missed. The other hit Taylor in the upper leg, causing massive blood loss that led to his death a day later. Because Rivera, now 23, was only 17 at the time, he faces life in prison instead of the death penalty if convicted.